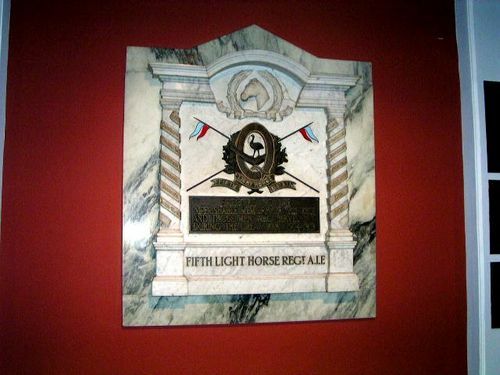 The tablet commemorates the members of the 5th Light Horse Regiment who served in World War One and is in memory of the 148 men who lost their lives. The tablet was unveiled by the Governor of Queensland, Sir Lesley Wilson on the 19th August 1936 in memory of the 148 men who had fallen in the Great War. 2500 men had passed through the ranks of the regiment which had a splendid record for gallantry since the days when it had volunteered to serve at Gallipoli as a dismounted unit. 474 of the unit had fought at ANZAC and it was the first unit to go into action against the Turks in Palestine. Townsville Daily Bulletin, 20th August 1936. Imperishable Memory Of This Regt. FIFTH LIGHT HORSE REGT. A.I.F.